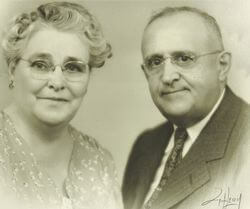 In 1924 Wilfred and Anna Reeves established Reeves Funeral Home in the 500 Block of East Division Street in Coal City. At that time the facility was primarily used as an office, floral shop and seamstress shop due to the preparation and wakes being held within the homes. In 1938 the new funeral home located at 75 North Broadway in Coal City was erected and it was at this time that visitations and services began to take place at the funeral home instead of the homes of the deceased. Wilfred and Anna’s two sons, Charles and James took over the business in 1957 after the death of their father Wilfred, and their mother Anna then passed away in 1966. Today, the Coal City funeral home is overseen by Matt Baskerville, who is privileged to carry on the fourth generation of long time honored tradition, trust and service excellence that the Reeves family has established. Annually since 2007, Matt Baskerville and Reeves Funeral Homes, Ltd has been a recipient of the National Funeral Directors Association Pursuit of Excellence Eagle Award. This award is the highest commendation in funeral service, and has placed us one of only five funeral homes in the state of Illinois, and among the top two percent of funeral homes nationwide. Matt is assisted by a family of staff who are all loyal and dedicated to the many we are privileged to serve. Leo and Karen Reeves continue to be available to the generations of families whom have called on them over the years. Funeral Directors: Alex Nolan, CPC, CCO and Jim Benuska work with Matt in serving families one on one. Our executive and personal assistant Sheila Allen, serves as a family service coordinator along with our business manager John Fonck, who is also our aftercare specialist. Violette Baskerville is our full time advance funeral planning counselor, and is designated as a Certified Prearrangement Consultant and Certified Funeral Celebrant. Our funeral assistant W. Scott Kuriger and visitation attendants: Gregory Reeves, Robin Cirrencione, John Hollmeyer, Debbie Plese, Sandi Dransfeldt, Jan Hibler, Kay Attaway, Mary Rossio, Betty VanWinsen and Dr. Craig Eckert are the individuals whom make certain that you are not only welcomed at the front doors of our funeral homes, but remain available to attend to all the needs of the family and guests during visitations and services. Raymond Baskerville, Ellen Peredetto, Don Jensen and Joe Fonck assist to ensure that our grounds, facilities and vehicles are meticulously maintained. We are truly blessed to have a group of such genuinely caring and supportive individuals. Our work together is what compiles the nationally recognized level of service that our communities have become accustomed. Wilfred and Anna's son James opened a Morris Branch in 1957. This location continues to operate at 408 East Washington Street in Morris. James and his wife Sylvia had three children: Lorna, Elaine and Leo. After the death of James in 1989 and Sylvia in 2000, Leo and his wife Karen continued on with the operations of both the Coal City and Morris funeral homes. Today the funeral home is overseen by Matt Baskerville who is privileged to carry on the long trusted reputation and tradition of service excellence that the Reeves family established over eight decades. Funeral Director, Certified Prearrangement Consultant and Certified Crematory Operator: Alex Nolan, lives on premises at the funeral home, and oversees the daily operations of the Morris location. Violette Baskerville, CPC, CFC is our full time staff member in the office daily. Violette works with families in making advance funeral arrangements. For more information about the myriad of funeral preplanning options, please call Violette to set up an appointment in our home or yours. Reeves Funeral Homes are the only funeral homes in Grundy County with full time Certified Prearrangement Consultants on staff. We also offer a full range of cemetery monuments and memorials, which can be customized and installed in any cemetery. Please feel free to stop by the funeral home or call 815-942-2500 to make an appointment. In February of 2007 Reeves Funeral Homes, Ltd. of Coal City and Morris acquired the former Gardner Funeral Home. The late 1800's structure located in downtown Gardner underwent a complete renovation and remodeling. In December of 2007, the funeral home reopened, and has since been providing unparalleled service to families of Gardner and the surrounding areas. We are honored to be a part of Gardner tradition for generations to come. Reeves Funeral Homes, Ltd. are the only local funeral service provider to have a full time staff of Certified Prearrangement Consultants, Certified Funeral Celebrants and a Certified Crematory Operator. Matt Baskerville is the only accredited Certified Funeral Service Practitioner in the county and Reeves Funeral Homes have been recognized annually as The Best Funeral Service Provider in Grundy Country, as well as one of the Best in Will County. Our service is unmatched, and we welcome visitors to read what others that we have served, have to say about us on the home page testimonials. For more information regarding Reeves Funeral Homes, Ltd. in Gardner, please feel free to contact us at 815-237-2526. In December of 2010, we were pleased to announce part of a new page in history with funeral service in the community. Freitag Funeral Home was acquired by Matthew Baskerville and Reeves Funeral Homes, Ltd. to honor the past, present and new future in funeral service throughout Wilmington and the surrounding communities. Matt is honored to provide an unparalleled level of service and create a new tradition for families whom he and the entire funeral home family are privileged to serve. Matt is the funeral service professional that the community knows, trusts, has counted on in the past, and can rely upon in the future. Annually since 2011, Matt Baskerville and Baskerville Funeral Home have been named a recipient of the National Funeral Directors Association Pursuit of Excellence Eagle Award. This award is the highest commendation in funeral service, and has placed Reeves Funeral Homes, Ltd. and Baskerville Funeral Home, two of only five funeral homes in the state of Illinois, and among the top two percent of funeral homes internationally. Five funeral homes in Illinois are honored. One is in Wilmington. For additional information regarding Baskerville Funeral Home and the services we offer, please feel free to stop by the funeral home or contact us at 815-476-2181.